Karen Duncan (Barbara Stanwyck) is a famed concert pianist who has been touring the world and essentially living any musician’s dream. But that all comes to a halt when Karen is admitted to a Swiss sanitarium to be treated for tuberculosis by Dr. Stanton (David Niven). Though she realizes she’s ill, Karen doesn’t quite understand how serious her condition is until she discovers that the woman who had been living in Room 17 (now Karen’s room) and many other patients at the sanitarium have died from the illness. Still, even after this realization and despite the fact that she’s attracted to him, Karen isn’t quite willing to completely obey Dr. Stanton’s orders. He warns her that she could die if she doesn’t rest completely. She must quit smoking, quit playing piano, quit drinking alcohol – in short, quit all of the things that she finds normal. Karen rebels against the strict rules of Dr. Stanton by making friends with her feisty and not-quite-rule-abiding neighbor Celestine (Joan Lorring) and taking up a forbidden romance with auto racer Paul Clermont (Richard Conte), who is in the Alps for an upcoming race. Karen and Celestine sneak off to town whenever they can for nights of boozy, smoky fun, and Karen meets Paul in town when she’s able to make it there. Soon enough, as their romance grows, Paul invites Karen to come to Monte Carlo with him. Will she risk her life for fun with Paul, or end up following the doctor’s orders to stay in the Alps and relax? 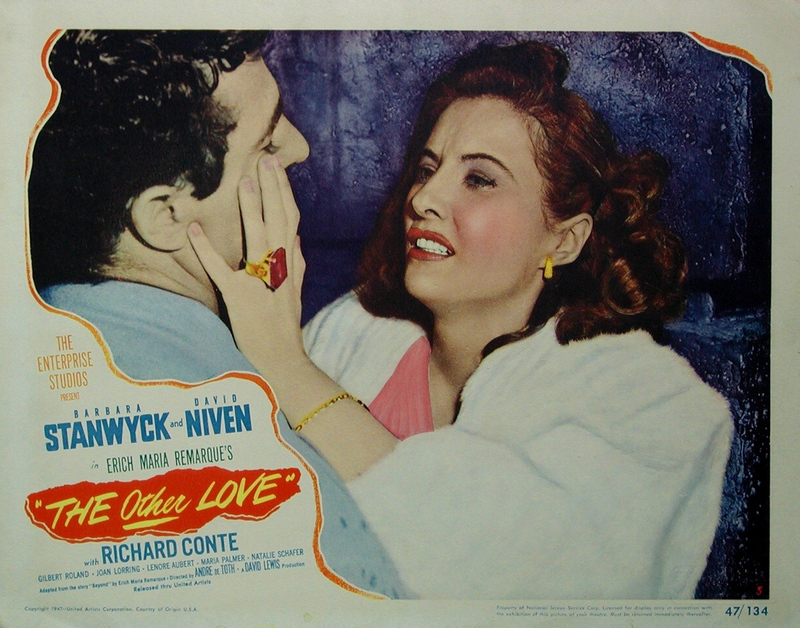 Andre De Toth directs 1947’s The Other Love, which was re-released theatrically in 1953 under the title Man Killer. The film is based on a story by Erich Maria Remarque. Interestingly enough, Remarque and the film’s director are both most well-known for their work on action-packed war flicks (Remarque’s All Quiet on the Western Front) and westerns (De Toth’s Day of the Outlaw), though this film is a tear-jerking romantic drama. I’ll begin by stating the obvious: Barbara Stanwyck is amazing as usual in this film. She appears in her most glamorous form here, donning both beautiful gowns and casual but still very classy (and sometimes elaborately detailed) outfits, making her most likely the best-dressed patient to ever spend time in a Swiss sanitarium. In terms of performance, it is Stanwyck’s portrayal of her character’s growing frustration throughout the film that is most striking. Another stand-out performance comes from the small role of Celestine, portrayed by Joan Lorring. Lorring’s career consists of less than 40 credits, mostly on television. Prior to watching The Other Love, I had only seen her in one episode of Alfred Hitchcock Presents, so she was definitely an unexpected source of stand-out support here. Her performance is energetic and she does a fantastic job of portraying the fact that her character is full of life despite her illness. Had this been a Thelma and Louise-type film rather than a pulpy, fatal illness-based drama, Lorring and Stanwyck would have made a very fun on-screen pair. 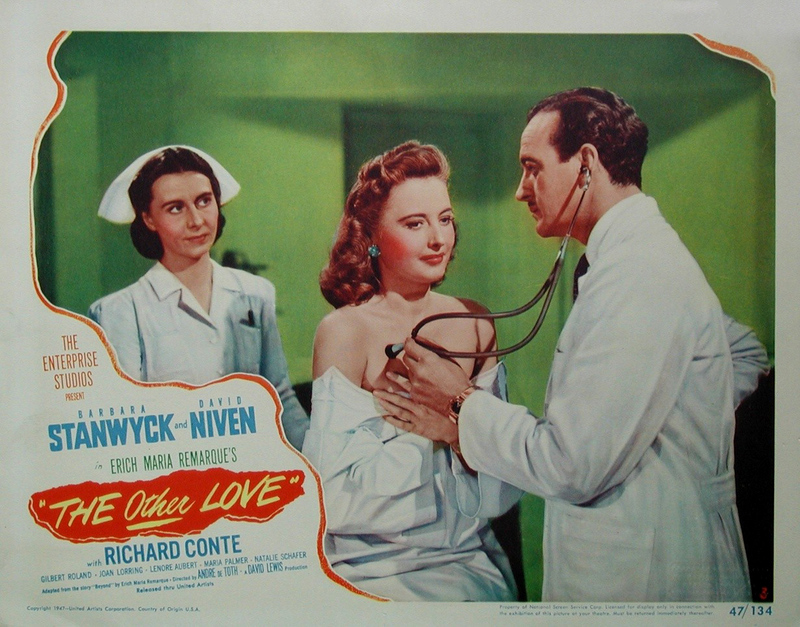 As for Stanwyck’s love interests, Niven and Conte are both a bit stiff, especially in the beginning of the film. They seem like attentive, nice people but there isn’t a whole lot of emotion or believability in either of their delivery, Niven in particular. 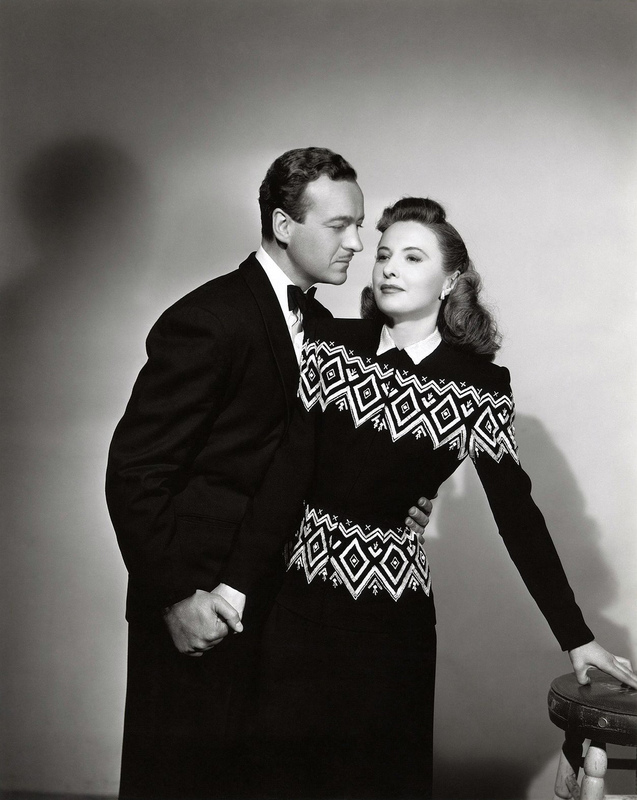 And to top that off, Stanwyck doesn’t have superb chemistry with either of them. Both of these issues do improve as the film progresses, though. The most striking technical element in The Other Love is certainly the use of music to convey the mood of Karen Duncan. It’s a bit of an obvious choice since the character is a musician and can seem a bit contrived if you think of it that way, but overall the sound in this film is very effective. Hi Lindsey. Just discovered as I am watching The Other Love on TCM right this minute! Never seen this one before so was looking for some background info. Wonderful that young people are still falling in love with old movies, much as I did when I was in my teens. Look forward to reading other posts on your blog. P.S. I would kill for Robert Osborne’s job! What fun that would be. Hi Lindsey, do you by chance know the title of the song sung by Maria Palmer in this film? She is stunning and I’m wondering if it’s a well know classic, or something more obscure. I loved all the music in this film, but the swing song stood out to me. I have no clue off of the top of my head, and IMDb doesn’t have it listed. I’ll do some more hunting when I have the time later and let you know if I come up with anything! Previous Previous post: Happy birthday, Joan Blondell!